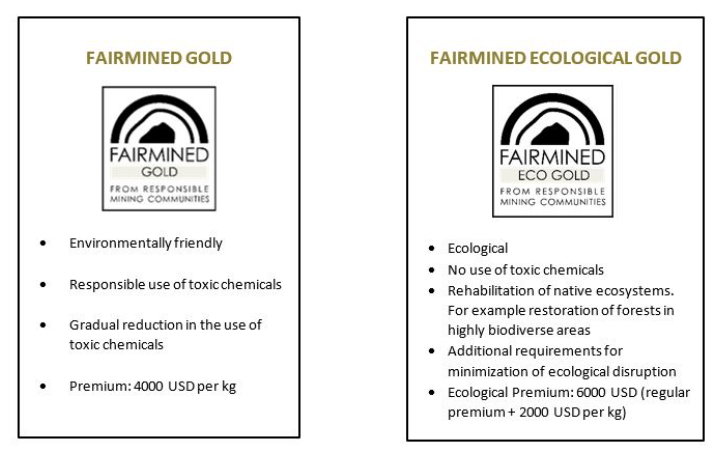 Fairmined > Miners > Fairmined Gold and Fairmined Ecological Gold: Differences and benefits. 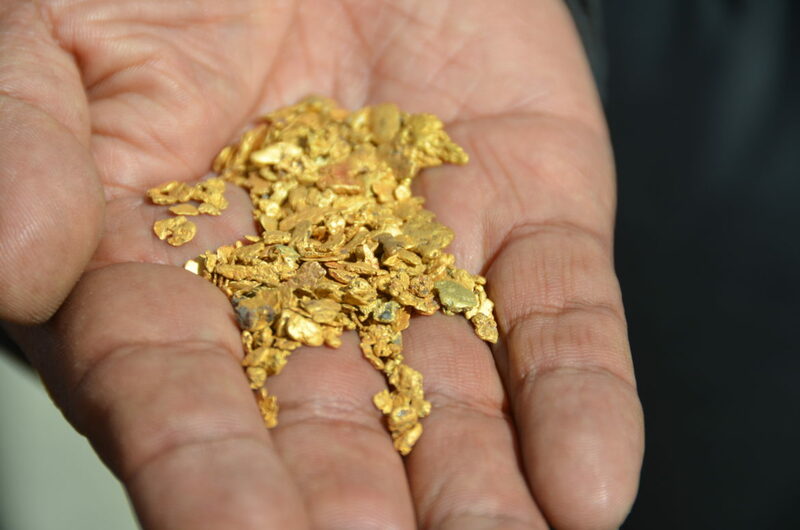 Have you ever heard about Fairmined Gold and Fairmined Ecological Gold? You still do not understand the difference? Here you will find some useful information to clarify your doubts. Since 2004, the Alliance for Responsible Mining (ARM) supports artisanal and small-scale mining (ASM) to promote the sustainable development of mining communities that implement responsible practices. With this objective in mind, ARM embarked on a journey of learning and reflections that several years later resulted in the Fairmined Standard. Supporting the socio-economic development of the communities through the Fairmined Premium and the Fairmined Ecological Premium. In addition, the Standard also includes requirements that must be met by the other participants in the responsible supply chain, which are the buyers of the certified metals. The gold produced under the standard is called Fairmined Gold. 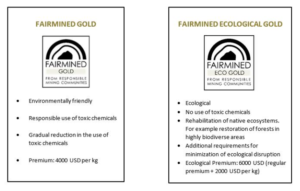 Fairmined Ecological Gold is produced under the same strict standard for responsible mining that applies to Fairmined Gold in terms of social, economic and organizational criteria. But there is a difference: Fairmined Gold is produced with responsible handling and the reduction of toxic chemicals such as mercury and cyanide, while Fairmined Ecological Gold is extracted and processed without using any toxic chemical at all within the mining organization. Furthermore the miners need to comply with additional requirements to minimize ecological alterations. The processing for the production of Fairmined Ecological Gold is characterized by not using any toxic substance for the recovery of gold but implementing gravimetric processes where equipment such as gutters, concentration tables, centrifugal concentrators or pans are used. 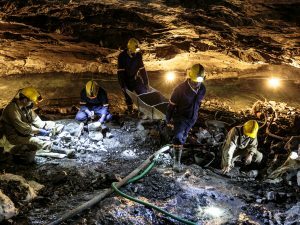 The most common toxic chemicals used in mining are mercury and cyanide. The mercury is mixed with minerals that contain gold, forming a mercury-gold amalgam that is then heated, evaporating the mercury and thus obtaining the gold. The leaching or extraction of soluble matter from a mixture through the use of cyanide, is when the miners use cyanide to dissolve and separate the gold from the mineral. When done correctly, it is considered a safer alternative to the use of mercury since the toxicity of the substance can be deactivated. If the cyanide is managed in an irresponsible manner, it can cause immediate damage. Mercury is a more gradual threat to people’s health and to the environment. Mercury is a chemical element that comes from both artificial and natural sources. It is not degradable and accumulates in the environment or in the body. The responsible use of these chemical products is allowed under the Fairmined Certification (not the Ecological Certification) as long as the legislation of the country allows it. This responsible use includes putting into practice methods of mercury recovery throughout the process, avoiding emissions to the atmosphere, soil and water, the proper disposal of waste and the training of personnel in charge of its management and disposal, as well as the use of protective equipment and appropriate places for the handling of these chemicals. However, the Fairmined Standard stipulates the gradual elimination of the use of these chemicals for the production of gold. 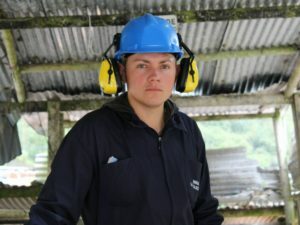 Although not all miners have the possibility of eliminating the use of toxic chemicals due to lack of access to appropriate technologies or geological circumstances, the Fairmined Standard encourages them to appropriate and implement responsible and ecological production chains, offering an additional premium over the gold sales price up to USD 4,000 if they produce Fairmined Gold and USD 6,000 for those mining organizations that commit to Fairmined Ecological Gold production. 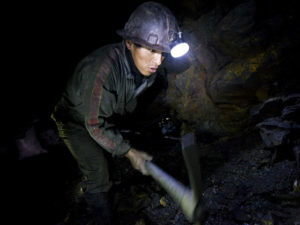 Responsible mining organizations can use the Fairmined Premium to make investments in cleaner technologies and other improvements in processing techniques. 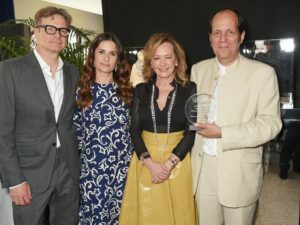 In addition, the premium also seeks to promote investment for changes in the community and improvements to common work spaces within the organization. Amalgam: Gold, silver and several other metals and their compounds are capable of alloying with mercury. These alloys are known as amalgams.